Hours of caffeine-fueled work with breaks only long enough to change locations overtake the normal flow of student life. There is little time for socializing and even less time for sleep. Is this the right approach, though? What if rest is actually the key to productivity? 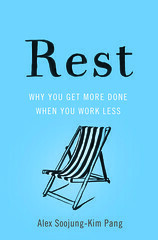 That is Alex Soojung-Kim Pang’s theory in his book “Rest: Why You Get More Done When You Work Less.” Pang, a sociologist and historian, states that the technological age’s promise of less work through more efficiency has actually been replaced by the nightmare of never leaving work behind. This is especially true for college students. Most work is done in dorms, apartments and coffee shops. There is almost no physical or temporal separation between work and the rest of life. Under the guise of convenience and comfort, working from any place and at any time has caused students to work long, distracted hours. These hours often replace healthy sleep schedules and free time…. It seems counterintuitive to spend valuable work time relaxing to gain more creativity or presence, but research supports the claim that people’s rest is valuable to their productivity. However, rest can be more than just a tool to increase productivity. It can also be a part of enjoying life as it happens instead of always looking to the next goal or accomplishment. Feeling that there is more to life than tests or one’s GPA and enjoying the journey itself as much as one’s successes can lead to more life satisfaction. This exam season, don’t forget to rest up. Roosevelt explained that he would spend “no more than a quarter of the typical day studying,” Newport writes, which typically amounted to only a couple of hours…. The future president would begin every day by mapping out his schedule from 8:30 a.m. to 4:30 p.m., making note of the day’s classes, daily athletic training, and lunch. The fragmented time that remained would be dedicated to studying, meaning that Roosevelt had an entire evening each day to pursue his many interests.